Caracas, Febr 7 (Sputnik) A campaign to collect signatures of Venezuelan citizens against the possible US military intervention in the country started in the Venezuelan capital of Caracas on Wednesday, a Sputnik correspondent reported from the city. On Sunday, US President Donald Trump that the military intervention aimed at settling the current political conflict in Venezuela was "an option." Venezuelan President Nicolas Maduro has lashed out at his US counterpart suggesting that Washington sought to appropriate Venezuela''s oil assets. Moreover, during a military parade on Monday, Maduro suggested that the campaign to collect people''s signatures against the US intervention would be held "in every square, army barracks, in every school and at every factory." These signatures are expected to be subsequently sent to the White House. Since the early hours of Wednesday, the supporters of Maduro have been gathering on the Plaza Bolivar in Caracas, located next to the buildings of the Venezuelan Foreign Ministry and the opposition-led National Assembly. "We are going to collect signatures in order to send the powerful message to the empire [the United States]," Erika Farias, the head of the Libertador Bolivarian Municipality, told reporters, stressing that Venezuela was against a military conflict. Dario Vivas, the leader of the ruling United Socialist Party of Venezuela, who is currently at the helm of the commission tasked with exploring the opportunities for holding the early presidential election, also participated in the collection of signature. 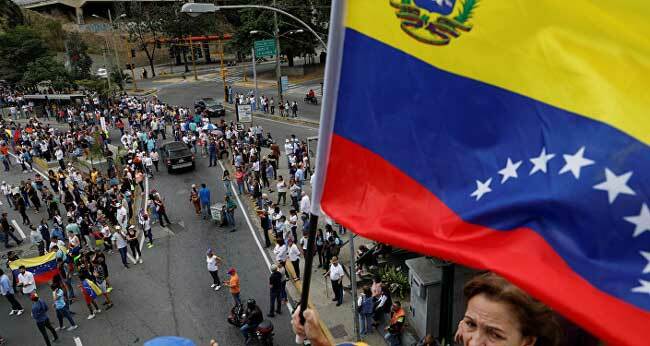 "The people of Venezuela reject the threats against our motherland voiced by the United States. We gathered here today in order to begin the process of the collection of signatures," Vivas said. In January, Juan Guaido, the speaker of the National Assembly, proclaimed himself Venezuela''s interim president, contesting Maduro''s re-election last year. The opposition leader was recognized by the United States and some other countries. Russia and China, as well as several other nations, have backed Maduro as the country''s legitimate president and demanded respect for the principle of non-interference in Venezuela''s internal affairs. On Monday, a number of EU member states individually recognized Guaido as Venezuela''s acting leader after the Venezuelan authorities failed to organize a new presidential election in the country within an eight-day period set by the EU states. EU countries were expected to recognize Guaido in a joint statement, but, according to a diplomatic source in Brussels, Italy vetoed the motion.